SEBRING, Fla. - Corvette Racing celebrated Corvette's 50th anniversary in international road racing with a victory in the Mobil 1 Twelve Hours of Sebring. The No. 4 Compuware Corvette C6.R driven by Oliver Gavin, Olivier Beretta and Jan Magnussen ran like clockwork throughout the 12-hour endurance race, finishing first in the GT1 class and third overall with a one-lap margin of victory over their rivals in the No. 009 Aston Martin DBR9. Ron Fellows, Johnny O'Connell and Max Papis finished fourth in the GT1 division and seventh overall in the No. 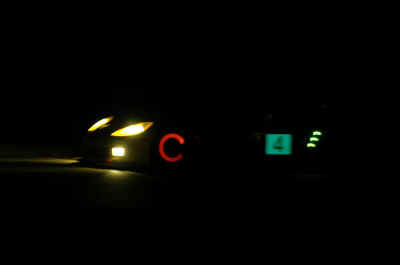 3 Compuware Corvette C6.R following a hard-fought battle with the No. 007 Aston Martin in the closing laps. "It was a brilliant victory because this is the 50th year of racing for Corvette, a heritage that began here in Sebring with a win in 1956," said Gavin, who notched this third Sebring title. "We're absolutely delighted." The Sebring victory extended the No. 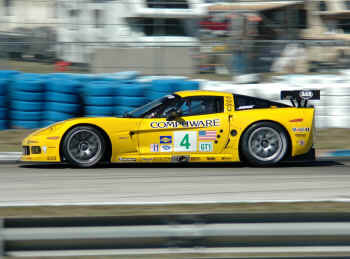 4 Corvette C6.R's winning streak in the world's great endurance races. The Gavin/Beretta/ Magnussen trio won the GT1 class in last year's 24 Hours of Le Mans and Petit Le Mans. GT1 co-champions Gavin and Beretta have now won every race in their last six starts, a streak that began in Portland in July 2005. "Each time I win a race with Corvette Racing, I always think, wow that was a good one!" said Beretta, who set the ALMS record for most career victories with his 25th win. "It looks like every time we go to a race that we need to win, it is another fantastic victory. "The car ran super fast, and we didn't have any problems at all," Beretta reported. "We just refueled and put on new tires, and we got the trophy as a team." The No. 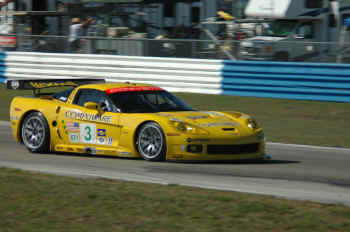 3 Corvette C6.R had to overcome a stop-and-go penalty following the first pit stop and a gearbox problem at the midpoint of the race. Repairs to the gearbox dropped the Fellows/O'Connell/Papis trio to fifth in class, 13 laps behind the leaders. The team battled back as Fellows, O'Connell and Papis all did extended stints behind the wheel. With 15 minutes to go, Papis trailed Tomas Enge in the No. 007 Aston Martin DBR9 by 1.9 seconds in a fight for the final spot on the podium. He cut Enge's advantage to .24-seconds in the final laps, but could not pull off a pass. "We had an advantage in the middle and end of the stint, thanks to the Michelin tires that were holding up better than the other guys' tires," Papis explained. "The Aston Martin definitely had a top speed advantage on the straights. I tried to pressure Enge into making a mistake, but he didn't make one. It was a fair battle, and they finished ahead of us." "We said all along that it was going to be a close race between Corvette and Aston Martin, and all of the things that were done to balance the cars were done for the fans," said Corvette Racing program manager Doug Fehan. "Tonight we put on a hell of a show, and I'm really pleased with the outcome. We had two great teams and great competition. The last 10 laps for third place was some of the most exciting racing we've seen in the ALMS." Corvette chief engineer Tom Wallace agreed: "The last 10 laps with Max and the Aston Martin were just sensational," he said. "The guys drove their hearts out and this team is unbelievable. The only thing that could have been better would be to get in the car and drive!" Corvette Racing's next event is the inaugural Lone Star Grand Prix in Houston on Friday night, May 12. The second round of the 10-race ALMS will be televised tape delay on CBS on Saturday, May 13 at 1 p.m. EDT.